Feeling hot and sticky before you step out the door? Survive the heat with these easy-to-implement tips. 1. Run when the conditions are coolest. 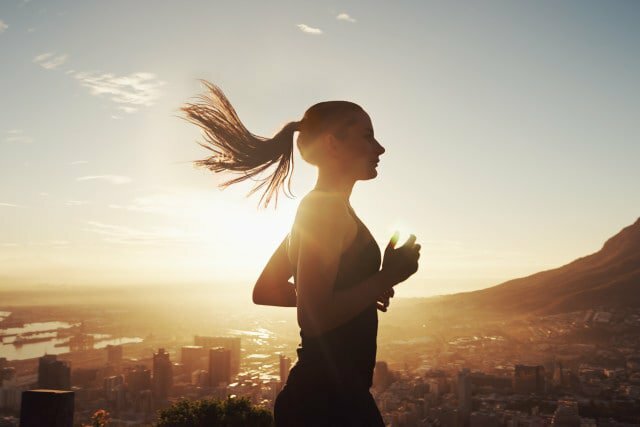 Take advantage of long summer days to run when the mercury is lowest, ideally in the early morning or evening. (Getting it done in the a.m. can boost your mood for the day, too!) If you’ve got a key workout on the schedule, consider taking it indoors so you can push harder without having to fight the heat. 2. Hydrate properly before, during and after your run. Warmer temps mean upping your fluid intake. Before your run, try to drink at least 250ml of water or sports drink every hour so your perspiration systems are in tip-top shape. Consider bringing fluids with you on the run in a water belt or pouch, or map out a run that hops from water fountain to water fountain. (Petrol stations, schools and city parks are often good options.) If you don’t like to carry fluids, stash bottles along your route for longer runs. Replenish post-run with an electrolyte-filled sports drink. 4. Run on grass in the shade. Asphalt retains heat and radiates it back upwards. If possible, find a park or trail with tree cover. 5. Wear light-coloured, loose-fitting clothes. Reflect the sun’s rays away from you (rather than absorbing them with dark gear), and avoid tight attire that won’t allow a breeze to get through. Steer clear of sweat-soaking cotton; instead, wearing moisture-wicking synthetic fabrics. Not only will you avoid harmful ultraviolet rays, but a layer of the stuff will keep your skin and body temperature lower. Don’t forget to apply on overcast days as well. Use SPF 30 or higher. 7. Pick the right headgear. You lose much of your body heat through your head, which is a good thing during the summer. Don’t cap it off with a snug, thick fabric hat. Instead, opt for a visor or roomier lid with breathable mesh. Lowering your body temperature in the hour before you run in the heat slows the rate at which your core temperature rises once you’re out the door. That translates into being able to run farther or faster than would otherwise be possible in the heat. Try sipping cool beverages and sit in an air-conditioned room.